Netflix’s first second original series House of Cards appeared online earlier this month. Set in a parallel universe Washington D.C. circa the present, House of Cards follows the rib-eating, Southern American English-speaking Representative Frank Underwood (Kevin Spacey) as he maneuvers for position after being passed over for Secretary of State. David Fincher is one of the show’s producers and directed the first two episodes. The whole thing is based on a BBC miniseries by the same name that was based on a novel by Michael Dobbs. I found it addictive but ridiculous. Perhaps most of all I was struck by the shots of Zoe Barnes, the intrepid female reporter character played by Kate Mara, working in her apartment in show’s first episode. Shots like this are consistent with Fincher’s habit of documenting — in films like Zodiac, The Social Network, and The Girl with the Dragon Tattoo — work. Or rather, his habit of conveying the feeling of massive amounts of what is often referred to as knowledge work taking place. 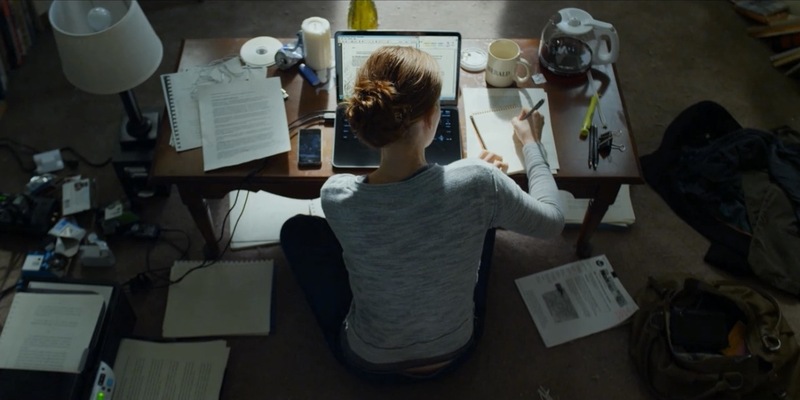 In a number of Fincher’s films we’re given glimpses of characters doing things like researching, writing, or coding. At some level, the bulk of his films are about characters trying to make sense of information. But such glimpses are by definition fleeting. Fincher does not so much film work as cleverly give the impression of its occurrence. Another good example of this from House of Cards is the education bill Underwood — whose name recalls a brand of typewriter — commissions. (Minor spoilers ahead.) We see Underwood hire a bunch of young speechwriter, K Street types, we see him charge them with writing a bill, we see them with their laptops open, we see them batting around ideas, we see them with their ties undone and their no-iron khakis wrinkled, we see them struggling to stay awake, and finally we see the 300+ page document they produce, but we never actually see them working. It’s a neat trick on Fincher’s part. It’s difficult to render knowledge work cinematically (quick, what’s the last great movie about writing you remember seeing? ), as opposed to physical work which more readily lends itself to Rocky-style montages, but Fincher has figured out a way to short circuit the process. Like all good filmmakers, he knows that if he gives us the signs, we will fill in the rest. Now, Zoe Barnes isn’t really a famous writer, and her workspace has been meticulously constructed by a production designer right down to the garbage, but there’s still something thrilling about getting a peek at it. Sadly, it’s the only peek we get. It’s as if Fincher knows this one look-see can legitimize all the work Zoe does throughout the rest of the series that we never see. Finally, I know her apartment is supposed to be junky — in a later episode Spacey’s character essentially asks her whether her parents know her place is a dump — but I sort of like it. With its stacks of paper, piles of books, and conspicuous coffee pot, it reminds me of a prototypical grad student’s apartment. Perhaps it’s no wonder, then, that Zoe seems to be halfway living with Lucas by the end of the thirteen episodes. Living like a grad student is no way to live.